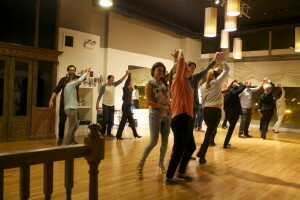 Hello Fellow Beginner Dancers, I’m Amanda; I currently work as an intern wedding dance studio where I get to observe people learning Salsa and Ballroom Dance. I am a brand new beginner level students. From time to time I get to participate in the classes watching people truly enjoy themselves, being involved, having questions about the sport intrigued me to start learning dance. 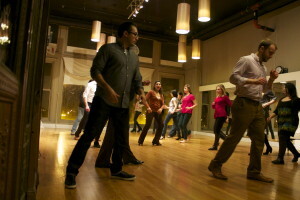 Walking into my first Salsa dance class I thought, this can’t be so hard, learning the basics. From a student’s perspective this was going to be a cinch, but I was wrong. Learning the steps individually isn’t that difficult, repeating and transitioning through corresponding moves with a partner gets tricky. While listening to questions about dance, there has been a few tips from wedding dance pro’s that stuck with me. The whole first class I heard hold your head up, I hope they aren’t talking directly to me, but I had no idea because my eyes were glued to my feet making sure I wasn’t stepping on my partners toes. Once you get into the rhythm of the move you gradually bring your eyes up to meet your partners, and you dance.Most important tips from the wedding dance pros; hold your head up and have fun. Dance is one of the most beautiful universal forms of communication. Theaters, movies, reality TV show and the Internet is loaded with the art of dance. The first thing to do when you decide to dance is choose a dance style that relaxes you. 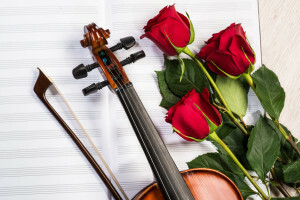 Love the music; if you can’t take the music seriously learning to dance to it will be difficult. Tips from the wedding dance pro’s say if you can’t feel the rhythm your partner and movements will be incoherent. Many can dance, many think they can dance, but everyone wants to look good dancing. Fortunately for beginner dancer’s there is a little rule to follow that can make you like you know what you’re doing. Tips from the wedding dance pro’s say not to take big steps while dancing; you want to look light on the feet. Small, swift steps make you look graceful and like you know what you’re doing. Big, over-corrected steps make the dance look overdone. From a student’s perspective the steps always seem small but beginners step big. One of the best parts of dancing is the spins and tricks, but it takes skill to do it beautifully. From a student’s perspective this is the most exciting part. One of my first times twirling I could feel myself doing it incorrectly. Tips from the wedding dance pros say not to hold the leaders thumb, because the movements will look like an awkward struggle. It’s important for the follower not to hold the leader to tight because they won’t be able to lead efficiently. A comment heard from dancers is that they want to watch dances online to familiarize with the steps. Tips from the wedding dance pros say it’s a good thing to watch dance videos, but there’s just as many wrong dance videos as there are good. You don’t want to learn how to do steps wrong, so just make sure the dance source is credible and practice away! At the end of my first dance class I left wanting to keep dancing! Everyone had a great time meeting and learning how to dance with each other. Try something good for you! 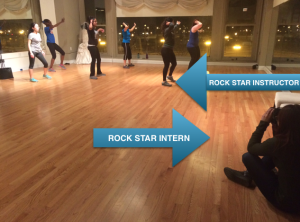 Find an awesome dance studio and become a pro dancer!